Fast, flat and fairly short (just under 1km), the course at Hilden Grange is tricky. Go off too fast and there is a risk of ‘blowing up’ (in runners’ speak! ); too slow and there is no way of catching the leaders. 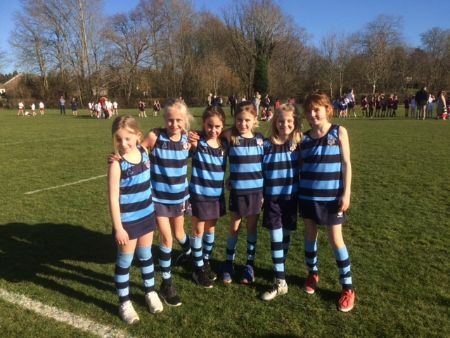 The race also attracts competitive schools from the Tonbridge/Sevenoaks area who, with limited playing fields, build fitness by running ‘a mile a day’. This bears fruit over short distances. Four of the six runners from Saint Ronan’s competed last year and it was plucky Jemima W who led the team home in eighth place. Mischa W has been a great asset to the team this year, leading her team mate until the final run-in (9th). The third and fourth scorers are key in the team event: Alice M running hard to cross the line in 31st, and Daisy A, still recovering from a nasty bout of flu, completing the four-to-score in 39th. Athena M ran a steady race (43rd) and it was great to see Bella B, in her first outing for the school, having only attended a couple of running sessions, still smiling as she finished the race in 53rd place. The girls were fifth of the ten complete teams. A good effort ladies.